This article first appeared in The Edge Malaysia Weekly, on September 18, 2017 - September 24, 2017. IT is no secret that many have been looking to stake a claim in the coming cashless revolution. But while others have been forming alliances and drawing up plans, DiGi.Com Bhd has seized the initiative by launching one of the country’s first e-wallet services backed by a large corporate — vcash. It was not launched with a flashy marketing campaign, nor does it come packed full of features. But it can boast something that most of the other 28 e-money licence holders authorised by Bank Negara Malaysia cannot — vcash is currently available for download from Google Play and the iOS App Store. “Our goal is to displace cash,” Praveen Rajan tells The Edge. He is the chief digital officer of Digi-X, DiGi.Com’s wholly-owned innovation arm that has spearheaded development of the app. vcash will not have to compete head to head with existing payment ecosystems like credit cards and debit cards. Instead, Praveen argues that there is plenty of room to grow by converting cash users to non-cash users. But Malaysians’ love affair with cash is not an easy one to break up. According to Bank Negara Malaysia statistics, cash in circulation as a percentage of gross domestic product — a measure of demand for cash — has been creeping up, reaching 6.6% last year, despite various cashless options available in the market. The key to DiGi.Com’s strategy is to roll out a low-cost, flexible and simple-to-use app that can be easily adopted by users and merchants. “How do we enable the new generation to feel comfortable with a digital payments solution that allows them to transact online? We want to make it as easy as possible for the users. The essence of it is that everybody can download the vcash app. “Users, merchants and any business owner can participate and there are few barriers — all they require is a phone and to download the app. There are no monthly fees, no terminal fees, none of that,” says Praveen. Compared with more mature e-wallets like Alipay and Tencent, vcash is much more basic. It can only transfer cash and make payments. However, some might argue that its simplicity can be considered a strength, especially in a market like Malaysia’s where consumers have been relatively hesitant to embrace alternatives to cash. In fact, Praveen argues the real challenge will not be competition from other e-wallets, but convincing Malaysians to give up cash and use an e-wallet at all. Thus, transferring money in vcash is as simple as keying in the recipient’s phone number. It works even if the recipient does not yet have the app. He or she merely needs to download the app and register it with said mobile number, and the money will be automatically deposited. Meanwhile, paying for goods and services is as simple as scanning a merchant’s unique quick response (QR) code at the shop. Note that vcash only uses static QR codes that can be printed out. Another key advantage of the simplified payment system is the low cost. Praveen says money transfers will be completely free of charge and payment transaction charges will be very low. Praveen is coy about the exact costs, but says it will be “definitely less than 100 basis points”. In contrast, he says, merchants currently pay about 1.5% to 1.6% in fees to facilitate credit card payments. He adds that the rates will be on flexible terms, depending on the scale of the business, which could mean flat-rate per-transaction fees for smaller business owners. While DiGi.Com may have the first-mover advantage, it certainly will not be the last. Competition to become the country’s dominant e-wallet player is likely to heat up in the coming years. After all, there are few barriers to entry. The competition is also expected to be intense, with some rivals like Touch ’n Go (a CIMB Group Holdings Bhd subsidiary) partnering Alipay’s parent company. Praveen, however, isn’t fazed by the possibility of competition. “Our position going in is that we want the competition to be there as we want to have other players to drive the market as well. Counting the 28 e-money licence holders and the other foreign players coming in, it’s a long list. But how many of them are executing their plans? We need to see more,” he says. That said, DiGi.Com is not without its advantages. With over 12 million subscribers, it plans to leverage consumers’ familiarity and confidence in the brand to market vcash to users and merchants alike. The value proposition is compelling for DiGi.Com. The group has over 9.7 million prepaid customers. Most of them still rely on cash to purchase top-ups. This is the key demographic that the group will aim to convert to its e-wallet ecosystem. Currently, the wallet has three levels. Simply registering with a phone number and IC number will grant a user a wallet limit of RM500. By providing more information, which will allow DiGi.Com to comply with Bank Negara’s know-your-customer requirements, the limit can be increased. Including a picture of the user’s identification will lift the limit to RM2,500. For the third level — a premium account — the user has to walk into an authorised centre for a face-to-face verification, which will lift the wallet limit to RM5,000. Users can also deposit money into their e-wallet through authorised physical stores, JomPAY or online banking. They can transfer the cash from their e-wallet directly to their bank account. Simply put, if DiGi.Com can convert a mere 10% of its prepaid users to vcash, with an average balance of RM250, that translates into an e-wallet ecosystem worth approximately RM243 million. But Praveen stresses that vcash is designed to be telco agnostic. In other words, the e-wallet will not discriminate against users of other telco networks. The idea is not to build fences that protect from competition, but to be open to competition. This is why vcash was deliberately branded at arm’s length to the DiGi.Com brand. It does not carry its name or even share the group’s iconic yellow branding. Instead it shares, subtly, the sky blue from DiGi.Com’s logo. Also in line with this philosophy of embracing competition, Praveen says vcash will not use a proprietary QR code system. 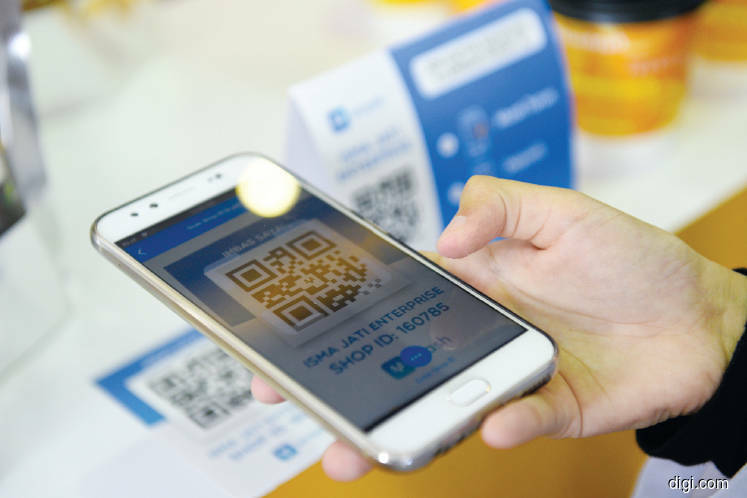 Instead, he says Digi-X is actively participating in discussions around standardising QR codes and has indicated to the industry that it would like to work with others on an interoperable QR code system. “Ultimately, we think QR codes will be a national standard. It’s just a question of who pushes it first,” he says. Of course, vcash will not remain in its current simple form forever. As adoption grows, Digi-X will look to move on to the next phase and introduce more functions into the platform. Praveen says Digi-X’s development team is already working on other projects which will complement the vcash app. “This current one is a version that we believe is ready to go out to market with the core functions. Our vision going forward is to enable an element of consumption within the app. So, as a natural extension of what we are doing, yes, users must be able to top up their DiGi.Com prepaid and pay their bills, or any other telco bill for that matter,” he says. Praveen declines to comment on the group’s internal targets for vcash. However, he says the key metric that will be looked at will be gross transaction value. At the same time, he concedes that vcash is unlikely to make a dent in DiGi.Com’s bottom line in the near future. Even if the app manages RM100 million in transaction volume the sub-1% fees charged are negligible for the group, which raked in over RM6.6 billion in revenue last year. “We believe that if we can stay long enough, the revenue will come. That revenue won’t come from charging a small merchant 1% or lower than 1%, but it will come from other things we will build on top of the platform,” he says. Praveen also makes it clear that vcash is not looking to compete with the banks. Instead, Digi-X is in talks with several financial institutions on integrating their products and services with vcash. “The banks can do so many things around credit, interest, savings accounts and so on. We can never do those things as the regulations are very clear. We can only do real-time transactions with real money. “We can’t play around with the money and give people more than they put into the wallet,” he says.